The light we are most familiar with is surely the light we can see. Our eyes are sensitive to light whose wavelength is in the range of about 400 nm to 700 nm, from the violet to the red. But for fiber optics with glass fibers, we use light in the infrared region which has wavelengths longer than visible light. Because the attenuation of the fiber is less at longer wavelengths. This text may mainly tell you what the common wavelengths used in fiber optics are and why they are used. In fact, light is defined by its wavelength. It is a member of the frequency spectrum, and each frequency (sometimes also called color) of light has a wavelength associated with it. Wavelength and frequency are related. Generally, the radiation of shorter wavelengths are identified by their wavelengths, while the longer wavelengths are identified by their frequency. Wavelengths typically range from 800 nm to 1600 nm, but by far the most common wavelengths actually used in fiber optics are 850 nm, 1300 nm, and 1550 nm. Multimode fiber is designed to operate at 850 nm and 1300 nm, while single-mode fiber is optimized for 1310 nm and 1550 nm. The difference between 1300 nm and 1310 nm is simply a matter of convention. Both lasers and LEDs are used to transmit light through optical fiber. Lasers are usually used for 1310nm or 1550nm single-mode applications. LEDs are used for 850nm or 1300nm multimode applications. As mentioned above, the most common wavelengths used in fiber optics are 850 nm, 1300 nm and 1550 nm. But why do we use these three wavelengths? Because the attenuation of the fiber is much less at those wavelengths. Therefore, they best match the transmission properties of available light sources with the transmission qualities of optical fiber. The attenuation of glass optical fiber is caused by two factors: absorption and scattering. Absorption occurs in several specific wavelengths called water bands due to the absorption by minute amounts of water vapor in the glass. Scattering is caused by light bouncing off atoms or molecules in the glass. 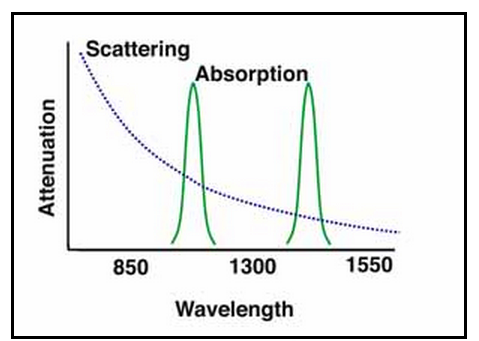 It is strongly a function of wavelength, with longer wavelengths having much lower scattering. From the chart below, we can obviously see that there are three low-lying areas of absorption, and an ever-decreasing amount of scattering as wavelengths increase. As you can see, all three popular wavelengths have almost zero absorption. After reading this passage, you may know some basic knowledge of wavelengths in fiber optics. Since the attenuation of the wavelengths at 850 nm, 1300 nm, and 1550 nm are relatively less, they are the most three common wavelengths used in fiber optic communication. 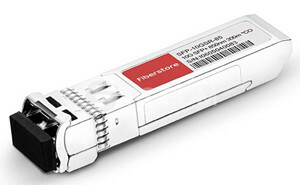 Fiberstore offer all kinds multimode and single-mode fiber optic transceivers which operate on 850 nm and 1310 nm respectively very well. For more information, please visit fs.com. This entry was posted in Fiber Cabling and tagged 1300 nm, 1550 nm, 850 nm, attenuation, Fiber Optics, fiber-optic transceivers, multimode fiber, single-mode fiber, wavelength on September 16, 2015 by Admin.